FAIRWINDS GROWS MY MONEY SO I CAN GROW MY BUSINESS. Look to us for great rates on Premium Business Money Markets. fairwinds.org Federally insured by NCUA. Are you on the outside looking in? Are you ready to use your expertise and passion to advance a cause that will change and strengthen our region? Do you want to step inside the circle of decision-making that is shaping the future? Are you ready to raise your hand in service to our family of communities? Through this one-of-a-kind experiential curriculum, you will learn the most important aspect of leadership – You can follow a leader or BE ONE! See for yourself how, since 1975, Leadership Orlando recruits, cultivates and encourages established and emerging leaders to better serve the Central Florida Region. Chair, Leadership Orlando Class 96 President & CEO, SIMETRI, Inc.
Marci Baugh Vice President, Finance & Accounting Massey Services, Inc.
Chris Blackwell Senior Project Manager Brasfield & Gorrie, LLC. Katie Flury Government Consultant GrayRobinson, P.A. Jay Fulbright Vice President BB&T - Branch Banking & Trust Co.
Chris Krepcho Director of Insurance Florida League of Cities, Inc.
Chris Lock Operations Manager Siemens Energy, Inc.
Devon McBrayer Orlando Account Manager Cubix, Inc.
Travis Owens Sales Director Cubix, Inc.
Michelle Weaver Vice President, Retail Operations Goodwill Industries of Central Florida, Inc.
About the Orlando Economic Partnership The Orlando Economic Partnership (the Partnership) works to provide the Orlando region with quality jobs, economic growth, broad-based prosperity and a sustainable quality of life. It is a not-for-profit, public/private partnership representing seven counties — Brevard, Lake, Orange, Osceola, Polk, Seminole and Volusia — as well as the City of Orlando. Now Accepting Enrollment for Class 98 – Class Begins September 4, 2019 Contact Danielle Permenter at 407.835.2444 or visit LeadershipOrlando.org to reserve your space! i4 Business Advisory Board WE’D LIKE TO THANK OUR ADVISORY BOARD MEMBERS FOR KEEPING THEIR FINGERS ON THE PULSE OF OUR COMMUNITY AND HELPING US BRING YOU THE BEST STORIES FROM AROUND CENTRAL FLORIDA. This Month's Featured Advisory Board Members Stina D’Uva For nearly 30 years, Stina D’Uva has been an integral leader in the Orlando community. As the President/CEO of the West Orange Chamber of Commerce for 18 years, she has helped grow the organization into a driving force of business that earned the coveted Chamber of the Year award from the Florida Association of Chamber Professionals in 2009, 2012 and 2015. D’Uva served as chair of the Florida Association of Chamber Professionals, and in 2014 she was elected and continues to serve as vice president of the MetroWest Master Association. Judi Awsumb is president of Awsumb Enterprises, a strateg ic business consulting company. She has more than 30 years of experience leading successful growth strategies for both corporate and entrepreneurial environments. She is the founder of WE-Women Entrepreneurs, powered by CEO Nexus, a group of second-stage business owners generating a minimum of $1 million in annual revenues. She has served on various advisory boards, including the ATHENAPowerLink board of governors; the Florida Executive Women board of trustees, where she is the programs chair; and the University of Central Florida Town & Gown Council. Harry Ellis Harry Ellis III is president and CIO of Next Horizon, a Sanford-based IT and digital marketing solutions company. He is responsible for carrying out business strategy and IT infrastructure required to support clients and the company’s sustained growth. Ellis, who has a master’s degree in computer forensics from the University of Central Florida, serves on the boards of directors for the Seminole State College Foundation and the Seminole County Sheriff Foundation and is current chair of the Seminole County Regional Chamber of Commerce. The June 2019 edition will focus on the area’s healthcare professionals that are dedicated to the wellbeing of our community. In our June issue, i4 Business® will include a special marketing section spotlighting the achievements and breakthroughs of these dedicated healthcare professionals throughout the Central Florida region. LEGAL PROFESSIONALS The July 2019 edition will include a special marketing section spotlighting the achievements and offerings of legal professionals throughout the Orlando region. 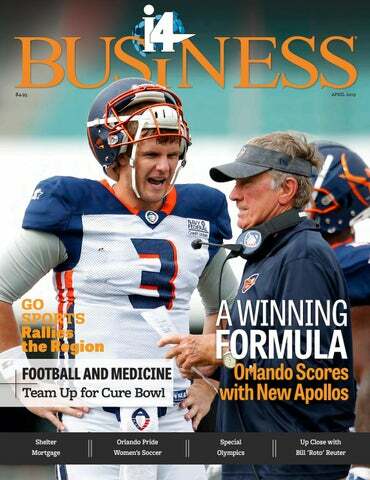 Visit i4biz.com or send $24.95 for a one-year (12 issues) or $39.95 for a two-year (24 issues) subscription to: i4 Business, 121 S. Orange Avenue, Suite 1500, Orlando, FL 32801. Please include name, mailing address, city, state, ZIP code, phone number and email. Please allow 4-6 weeks for subscription to start. DIGITAL EDITION A digital edition of the current edition is available online at i4biz.com. CHANGE OF ADDRESS: If you are moving or changing the mailing address for your subscription, send your complete old address (where the magazine is currently being mailed) and your complete new address, including ZIP code, to info@i4biz.com. BACK ISSUES Back issues may be purchased for $5.00 each by calling 407-730-2961. REPRINTS Reprints and commemorative plaques may be ordered from Meaghan Branham with i4 Business, 321-7598977. No other companies offering similar products or services are affiliated with i4 Business. CONTRIBUTE Send press releases, article submissions, announcements and images to press@i4biz.com. Please provide 2-3 months advance notice for requests for event announcements and/or coverage. 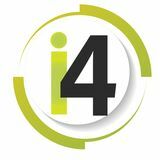 i4 Business® is published monthly by i4 Business, LLC, 121 S. Orange Avenue, Suite 1500, Orlando, FL 32801. Tel. 407-730-2961 | i4biz.com The contents of i4 Business magazine, i4biz.com and any other media extensions related to the brand, including advertisements, articles, graphics, websites, web postings and all other information (“contents”) published, are for informational purposes only. i4 Business® and all other affiliated brands do not necessarily endorse, verify, or agree with the contents contained in i4 Business. i4 Business makes no warranties or representations, express or implied, as to the accuracy or completeness, timeliness, or usefulness of any information contained or referenced. i4 Business shall not be held liable for any errors or omissions. © 2019. All rights reserved. Any reproduction, in whole or in part, is prohibited without written permission from the publisher. Communication and delivery platforms continually change and evolve. The constant in that change is the power of story. Print or digital, whatever platform you use, we have a way for you to connect to that story. TV screens. We were cheering for the unranked University of Central Florida men’s basketball team in a close game they eventually won against the eighth-ranked Houston Cougars. Whether we were Gators, Seminoles or Hurricanes, that evening we were all Knights. During commercials, we talked about whether the brand-new Orlando Apollos football team would win their fourth game that night in Salt Lake City, where heavy snow was predicted. (They did.) We were all comrades in arms. That’s how it is with sports. And with friendly competition. Some people don’t care about basketball, but they’ll watch “Top Chef,” “Iron Chef ” or “Beat Bobby Flay” on TV all day long. Others will tune in every week to watch “Dancing with the Stars,” “America’s Got Talent,” “American Idol” or “The Voice.” And others are superfans of “The Bachelor,” “The Bachelorette” or “Survivor.” It doesn’t matter whether you’re into baking pies, growing pumpkins or buying abandoned storage units, there is a competition for you. Competitive events help us escape. Many of us are running businesses, working with nonprofits, raising families, caring for aging parents, dealing with finances, studying for degrees, taking care of houses and yards, braving weather elements … the list goes on. Anything that helps us take a healthy rest from all of these daily pressures has to be good for us, right? It only makes sense that a place known for family-friendly entertainment options would also increasingly become known for sports. People are coming to Orlando from all over the world as competitors and spectators. And the sports industry is only going to continue to grow here. That is definitely OK with me. Have a great month! Lockheed Martin Unveils $50 Million R&D Facility Lockheed Martin opened a $50 million, 255,000-square-foot Research & Development II facility in Orlando that will support engineering, program management and business operations for the company’s Missiles and Fire Control division. The company has created more than 1,000 local jobs since 2017 to support this facility and its others in Central Florida, with hundreds more expected over the next three to five years. “The Research & Development II facility expands our robust Florida presence and fosters significant opportunities for collaboration and innovation among our employees,” Lockheed Martin Missiles and Fire Control Executive Vice President Frank St. John said. “We will continue our strong partnerships with local and state governments, community partners and area universities to grow our business, our workforce and the critical capabilities we provide to customers worldwide." Orlando City Commissioner Regina Hill, Lockheed Martin Operations Vice President Pat Sunderlin, Lockheed Martin Missiles and Fire Control Executive Vice President Frank St. John, Orange County Mayor Jerry Demings, Orange County Commissioner Victoria Siplin, and U.S. Army Colonel Wallace Weakley. Lockheed Martin officially broke ground for the six-story building on Feb. 14, 2018, with an aggressive goal of completing it in a year. The company’s operations support an estimated 40,000 direct, indirect and induced jobs in Florida, with work spanning 1,300 businesses and suppliers. have been clinically proven to elevate wellbeing by inspiring purposeful living and fostering sustained improvements in participants’ energy levels.” Since co-founders Dr. Jim Loehr and Dr. Jack Groppel opened the doors to the first facility in the 1990s, thousands have exp er ience d science -b ase d training solutions offered by world-class behavioral, exercise and nutrition experts. estimates there are more than 13,000 unfilled cybersecurity jobs in Florida alone. That trend is expected to continue, with the U.S. Bureau of Labor Statistics predicting jobs for information security analysts will grow 28 percent by 2026. The 970-square-foot lab is located in UCF’s Engineering I building and will serve as a learning hub for more than 350 students participating in cyber programs at UCF. Hack@UCF, a four-time national champion in cyber competitions, will use the lab as its primary practice center. In Orlando, Lockheed Martin employs approximately 2,500 UCF graduates, with plans to expand its cyber workforce. The company’s local Cyber Solutions business grew 400 percent over the past five years. David Maria, UCF's Collegiate Cyber Defense Club's president, showcases some of the Lockheed Martin Cyber Innovation Lab’s technology and capabilities it will bring to students as they prepare for competitions and future careers. WANT TO SHARE YOUR NEWS? Do you have some news you’d like us to share with the community? Please be aware that we work two to three months in advance of our publication date. Submit press releases and announcements to press@i4biz.com. Digital Orlando 2019 will explore how technology and innovation will shape our culture, companies, and community. YOU’RE INVITED TO JA INSPIRE, Junior Achievement of Central Florida’s annual hands-on, interactive career exploration program for nearly 3,500 8th grade students from Osceola County. This is an opportunity to engage students with your company as we showcase Central Florida careers from regional businesses, non-profits, government, and educational organizations. APRIL 11, 2019 WHY JA INSPIRE By participating in JA Inspire, you can: • Provide career practice for area youth. • Inspire nearly 3,500 8th grade students to become workforce-ready in time to plan their coursework for high school. • Share career pathways for high growth, high need industries and careers from our region through interactive exhibits. • Engage with your future talent pipeline! • 1 in 5 work in the same field as their JA volunteer or mentor. • 1 in 3 credit JA with influencing their career decision. • Fund student participation including transportation and curriculum. • Exhibit and mentor visiting students at career stations. Waddell said. Ruskell has worked with the NFL in several high-level leadership positions for teams including the Seattle Seahawks, Chicago Bears, Atlanta Falcons and Tennessee Titans, where he held titles including president/general manager, director of player personnel and director of college scouting. He spent his teen years in the Tampa Bay area and graduated from the University of South Florida. About half of the Apollos team members have played college football for teams Central Florida was ripe for an AAF including the UCF Knights, the Florida Gators, team, Waddell said, because it loves the Florida State Seminoles, the Miami sports. Especially football. He names all Hurricanes and the Bethunethe different events Orlando hosts — Cookman Wildcats. everything from college bowl games to the NFL “We have guys who were known to the Pro Bowl to high school games and adult fandom here,” Waddell said. 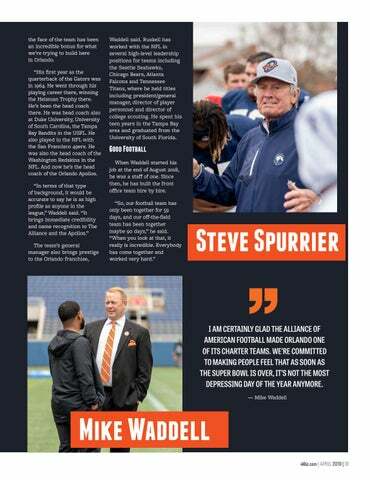 “They’re football flag excited not only to see Coach Spurrier but football leagues. also to engage with these former collegiate stars from the state of Florida and have them “It’s a great town with great weather all said. be united here on one team as Apollos.” — an outstanding sports town,” he “When you look at the success 30 years A 30-year veteran of professional and ago of the Orlando Magic launching, and college sports, Waddell had spent the then the Solar Bears and what Orlando City previous two years as vice president at Soccer has done … it’s a great sports town Richmond Raceway, a Virginia track that and deserving of a football team. We’re hosts the Monster Energy NASCAR Cup excited to fill that void.” Series and the NASCAR Xfinity Series. The Apollos roster includes 29 men who Working on only two events a year was a have played college football for teams shock to the system for someone who was including the UCF Knights, the Florida in college athletics for 28 years and had Gators, the Florida State Seminoles, the games on his schedule 46 weekends a year, he Miami Hurricanes and the Bethune-Cookman said, laughing. Wildcats. Versatile Offerings With the slogan “Terrain for every game,” GO Sports has been positioning Orlando as a place that can host nearly any kind of sporting event. One of the biggest would be World Cup Soccer by FIFA, the Fédération Internationale de Football Association. Orlando was one of nine U.S. cities to host the 15th FIFA World Cup in 1994 and still counts that as one of its crowning achievements. Orlando is in the running to be one of 23 North American cities that host the 2026 event. FIFA accepted a joint bid from the U.S., Canada and Mexico in June 2018 and is narrowing down the host cities to three in Canada, three in Mexico and 10 in the U.S. Orlando, with a capacity of 68,000 at Camping World Stadium, wants to be one of them. 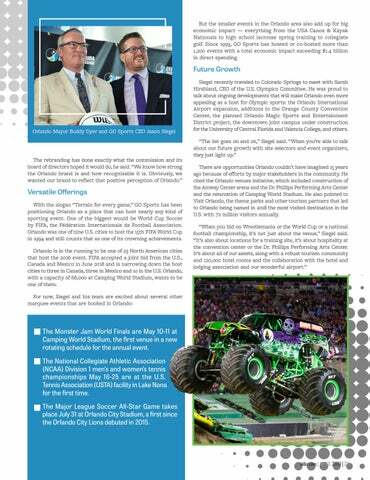 The Monster Jam World Finals are May 10-11 at Camping World Stadium, the first venue in a new rotating schedule for the annual event. The National Collegiate Athletic Association (NCAA) Division 1 men’s and women’s tennis championships May 16-25 are at the U.S. Tennis Association (USTA) facility in Lake Nona for the first time. The Major League Soccer All-Star Game takes place July 31 at Orlando City Stadium, a first since the Orlando City Lions debuted in 2015.
n April 14, the Orlando Pride women’s soccer team will kick off its fourth season with a match against the Portland Thorns — a game that will mark not only the first of the new year, but the first under new leadership. On the third Saturday every December since 2015, about 20,000 people file into the stands of Camping World Stadium for a college football game that might be easy to mistake for any other — if it weren’t for one bright pastel exception. game to the Orlando market. One thing led to another, and former UCF football coach Alan Gooch was brought into the conversation. At an exploratory meeting, John Rhodes suggested he would like a new bowl game to raise money for breast cancer awareness. His sister, Laura Goldstein, had been diagnosed with stage 4 metastatic breast cancer. Gooch had entered the meeting unconvinced of a need for a third college bowl game in Orlando. Today, he looks back at how this sobering news, and the words of other women in similar fights, sparked the moment of conviction about how the bowl would be handled — and how it would help. “There were five women at the meeting with Laura, all with bandanas on their heads,” Gooch said. “I quickly learned that all five women were in the middle of undergoing chemo and fighting for their lives. They came up to me and we began talking. OF THE $3.6 MILLION RAISED SINCE THE START OF THE CURE BOWL, $1.2 MILLION HAS GONE TO KHALED’S RESEARCH. THE FOUNDATION DISTRIBUTES THE REMAINDER NATIONALLY AND INTERNATIONALLY. for the researchers to meet to receive funding. 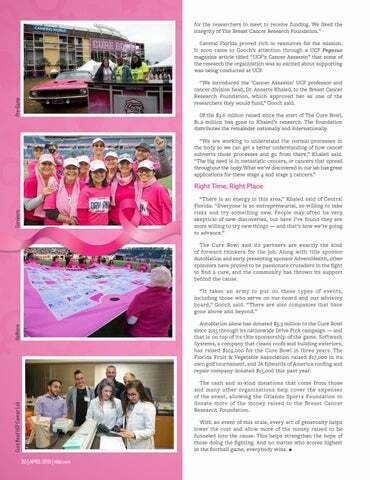 We liked the integrity of The Breast Cancer Research Foundation.” Central Florida proved rich in resources for the mission. 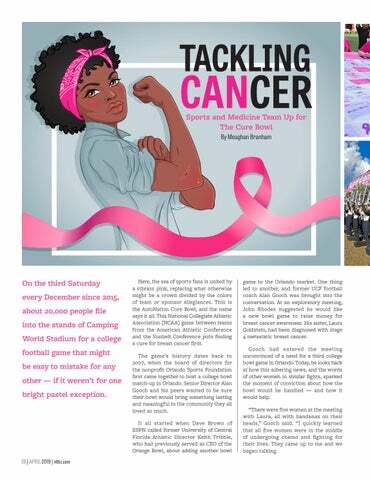 It soon came to Gooch’s attention through a UCF Pegasus magazine article titled “UCF’s Cancer Assassin” that some of the research the organization was so excited about supporting was being conducted at UCF. 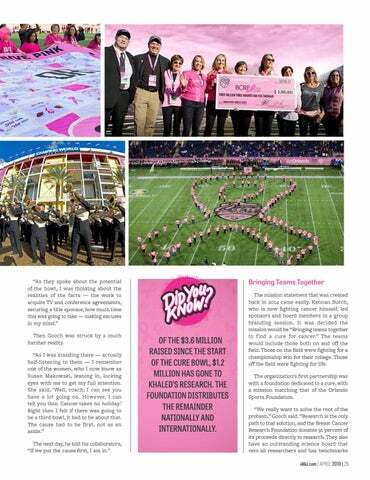 AutoNation alone has donated $3.3 million to the Cure Bowl since 2015 through its nationwide Drive Pink campaign — and that is on top of its title sponsorship of the game. Softwash Systems, a company that cleans roofs and building exteriors, has raised $103,000 for the Cure Bowl in three years. The Florida Fruit & Vegetable Association raised $17,000 in its own golf tournament, and JA Edwards of America roofing and repair company donated $15,000 this past year. techniques to improve a player’s performance and mindset. with Official tourism association for America’s most-visited destination. raveling may be a violation in the rules of basketball, but it’s a win for growing Orlando’s profile as a sports destination. The globetrotting Orlando Magic use their platform to tell Orlando’s story and invite fans to discover the area’s array of world-class athletic venues. We recently spoke with Charlie Freeman about those initiatives — and the latest on the Magic’s emerging entertainment district in downtown Orlando. 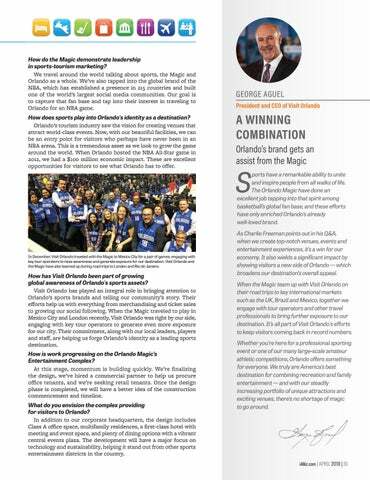 How do the Magic demonstrate leadership in sports-tourism marketing? We travel around the world talking about sports, the Magic and Orlando as a whole. We’ve also tapped into the global brand of the NBA, which has established a presence in 215 countries and built one of the world’s largest social media communities. Our goal is to capture that fan base and tap into their interest in traveling to Orlando for an NBA game. 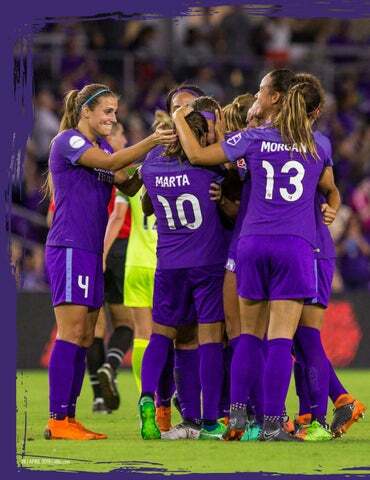 How does sports play into Orlando's identity as a destination? Orlando’s tourism industry saw the vision for creating venues that attract world-class events. Now, with our beautiful facilities, we can be an entry point for visitors who perhaps have never been in an NBA arena. This is a tremendous asset as we look to grow the game around the world. When Orlando hosted the NBA All-Star game in 2012, we had a $100 million economic impact. 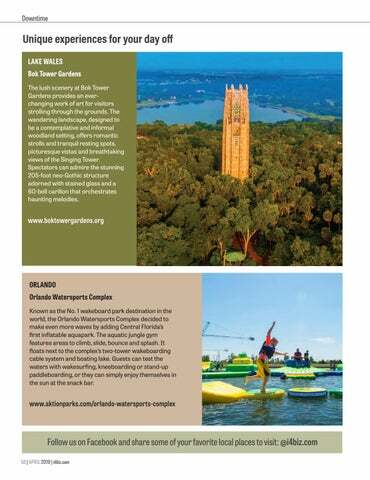 These are excellent opportunities for visitors to see what Orlando has to offer. ports have a remarkable ability to unite and inspire people from all walks of life. The Orlando Magic have done an excellent job tapping into that spirit among basketball’s global fan base, and these efforts have only enriched Orlando’s already well-loved brand. In December, Visit Orlando traveled with the Magic to Mexico City for a pair of games, engaging with key tour operators to raise awareness and generate exposure for our destination. Visit Orlando and the Magic have also teamed up during road trips to London and Rio de Janeiro. How has Visit Orlando been part of growing global awareness of Orlando's sports assets? Visit Orlando has played an integral role in bringing attention to Orlando’s sports brands and telling our community’s story. Their efforts help us with everything from merchandising and ticket sales to growing our social following. When the Magic traveled to play in Mexico City and London recently, Visit Orlando was right by our side, engaging with key tour operators to generate even more exposure for our city. Their commitment, along with our local leaders, players and staff, are helping us forge Orlando’s identity as a leading sports destination. How is work progressing on the Orlando Magic’s Entertainment Complex? At this stage, momentum is building quickly. We’re finalizing the design, we’ve hired a commercial partner to help us procure office tenants, and we’re seeking retail tenants. Once the design phase is completed, we will have a better idea of the construction commencement and timeline. What do you envision the complex providing for visitors to Orlando? In addition to our corporate headquarters, the design includes Class A office space, multifamily residences, a first-class hotel with meeting and event space, and plenty of dining options with a vibrant central events plaza. The development will have a major focus on technology and sustainability, helping it stand out from other sports entertainment districts in the country. As Charlie Freeman points out in his Q&A, when we create top-notch venues, events and entertainment experiences, it’s a win for our economy. It also wields a significant impact by showing visitors a new side of Orlando — which broadens our destination’s overall appeal. When the Magic team up with Visit Orlando on their road trips to key international markets such as the UK, Brazil and Mexico, together we engage with tour operators and other travel professionals to bring further exposure to our destination. It’s all part of Visit Orlando's efforts to keep visitors coming back in record numbers. Whether you’re here for a professional sporting event or one of our many large-scale amateur athletic competitions, Orlando offers something for everyone. We truly are America’s best destination for combining recreation and family entertainment — and with our steadily increasing portfolio of unique attractions and exciting venues, there’s no shortage of magic to go around. new financial questions in need of answers. Instead of turning to a quick web search or the advice of friends and family outside of the industry, seeking the guidance of a lender has the power to save time and money — and to make sure that even a big financial decision doesn’t have to be a difficult one. 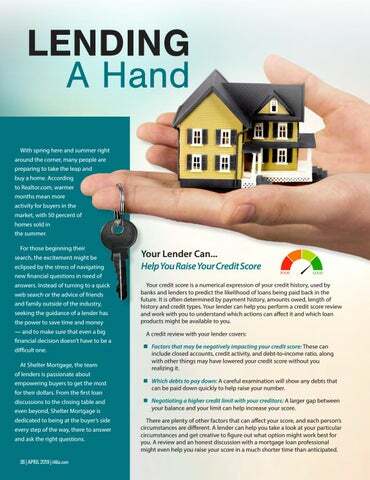 At Shelter Mortgage, the team of lenders is passionate about empowering buyers to get the most for their dollars. From the first loan discussions to the closing table and even beyond, Shelter Mortgage is dedicated to being at the buyer’s side every step of the way, there to answer and ask the right questions. Your credit score is a numerical expression of your credit history, used by banks and lenders to predict the likelihood of loans being paid back in the future. It is often determined by payment history, amounts owed, length of history and credit types. Your lender can help you perform a credit score review and work with you to understand which actions can affect it and which loan products might be available to you. A credit review with your lender covers:  Factors that may be negatively impacting your credit score: These can include closed accounts, credit activity, and debt-to-income ratio, along with other things may have lowered your credit score without you realizing it.  Which debts to pay down: A careful examination will show any debts that can be paid down quickly to help raise your number.  Negotiating a higher credit limit with your creditors: A larger gap between your balance and your limit can help increase your score. There are plenty of other factors that can affect your score, and each person’s circumstances are different. A lender can help you take a look at your particular circumstances and get creative to figure out what option might work best for you. A review and an honest discussion with a mortgage loan professional might even help you raise your score in a much shorter time than anticipated. There may be equity in your home that can be used for debt reduction, which can then help strengthen your debt-to-income ratio and increase your buying power. Knowing what you have in equity may also help you to determine what home you may be able to afford if that property was sold. A review of each of your existing loans can help determine which can be refinanced, to help them better align with your credit goals, dropping your monthly payment and leading to a better purchase limit. Having another person added to the mortgage may help you qualify for loans that otherwise may be unavailable because of a low debt-to-income ratio. Empower You on Your Path to Your Dream Home The good news is that on the path to buying a new home there are plenty of chances to make sure you get the best possible deal. However, with all of the possible product options, financial plans and steps along the way, going it alone leaves too much at risk and may leave you feeling in the dark. It doesnâ&#x20AC;&#x2122;t cost anything to apply, or to seek out the advice of a mortgage professional like those at Shelter. Its lenders are armed with years of expertise and industry knowledge that they carefully leverage for each buyer and are passionate about open and thorough communication to make sure buyers feel empowered in their search. Your lender can illuminate paths to the dream of homeownership and guide you along step by step. 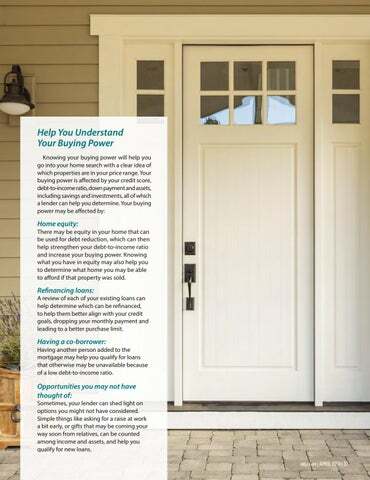 You may be pleasantly surprised to learn you are closer than you think to becoming a homeowner. © 2018 Shelter Mortgage Company, L.L.C. All Rights Reserved. This communication does not constitute a commitment to lend or the guarantee of a specified interest rate. All loan programs and availability of cash proceeds are subject to credit, underwriting and property approval. Programs, rates, terms and conditions are subject to change without notice. Other restrictions apply. Shelter Mortgage Company, L.L.C, 4000 W. Brown Deer Road, Brown Deer, WI 53209. Corp NMLS#431223 (www.nmlsconsumeraccess.org). 408 East Ridgewood St. Orlando, FL 32803. Yari Fumero - FL/#36477; NMLS#552492. Kent Winkelseth - FL/#LO17485; NMLS #552527. Rolando Garcia - FL/#LO39842; NMLS#476625. Bill “Roto” Reuter has always been one to lead by example. His nearly 30-year career in the Navy, where he served as both a test pilot and as commander for their premier training and development organization, required him to navigate high-pressure situations all while establishing his own leadership values, but both his personal and professional outlook began to take shape long before that. He recalls his first “job” was at the age of 7, painting trailer hitches for his father and grandfather’s mobile home business in Key West. Under their guidance, he learned perseverance and attention to detail early on, as well as a respect for every client, co-worker and mentor. Now, he serves as president of R-Squared Solutions, acting as everything from business coach to motivational speaker, and leading both his team and others toward an approach rooted in communication, philanthropy and dedication. What did you want to be growing up? I was very fortunate to have my version of “clarity” at an early age. At the age of 8, my grandfather took me from our home in Key West to the Cape in mid-July of 1969. Most of us in Central Florida are very familiar with the significance of that month. After being on the jetty just north of Cocoa Beach on July 16 for the launch of Apollo 11, it was crystal clear to me that I wanted to be an astronaut. I was hooked. I stepped out with the naivete of a child to pursue that dream, knowing that even if I didn’t make it, I was going to chase it. How would you describe the path/previous experiences that led you to your current role? when I started. This led to a very gratifying career in the Navy and beyond. How did being a test pilot help you develop your clarity of purpose? The only thing I knew about test flying before becoming a test pilot were the things I would see in movies like The Right Stuff. I was always fascinated by the marriage of engineering and flying, two things I enjoy. I learned in order to be an effective test pilot, beyond the “stick and rudder” skills, I needed the ability to translate between the two domains. I discovered that I had a knack for that. This same communication acumen I then used to add value to people and organizations by translating across multiple boundaries the best I could. It led me to understand the value of “connecting” rather than just “communicating.” This revealed for me the purpose of working to add value both personally and professionally to people and organizations. How does your experience as a veteran influence your approach to bettering the community? As veterans, we are exposed to so many things, some negative, but the overwhelming majority were positive. Beyond the more obvious things like discipline, perseverance and order, we develop a deeper understanding of leadership, service, stewardship, culture and climate. I believe it is crucial for veterans to be good stewards of these gifts in serving their community well beyond the time they spend serving in the cloth of our great Nation. How do you select the boards and community organizations you have been involved in? UP CLOSE time and energy into this crucial issue, but it continues to be gratifying beyond words. This has led me to pursue a project called “HomeMore,” which focuses on more novel approaches in addressing the homeless and at-risk in our nation. With the Navy League, it was about preserving our history of the Navy in Central Florida through the Lone Sailor Memorial in Bluejacket Park. On the civic side, it is about contribution and rich relationships with other leaders. They enrich me and I am grateful. As the chair of the Florida Defense Contractors Association, it is about enhancing the connective tissue between businesses small and large across the state while providing insights on how government agencies can facilitate an even richer ecosystem, much like my work with the National Center for Simulation. How do you lead such large teams? What advice do you have for other leaders? I will say that I believe we often confuse management for leadership. The first law of the 21 Irrefutable Laws of Leadership (John Maxwell) is the “Law of the Lid,” meaning an organization cannot grow beyond the leader’s ability to lead. The larger the team, the more capable the leader needs to be, not in managing people but leading them. Understanding that difference is crucial. I chose to figure out ways to connect and resonate with as many of the levels of the organization as possible. This takes a ton of energy and investment in the people, but the results have been tremendous. Leaders need to continue to grow as leaders and not “preside” but LEAD. In my last leadership role in the Navy, there were over 1,200 people, mostly civilians, of very diverse disciplines and backgrounds. In order to create clarity of identity, I would say three things every time I was before the team: “Transparency breeds credibility, seniority does not equate to superiority and leadership is a servant activity.” One of the most challenging things in leading large organizations is creating clarity throughout the organization down to the “deckplate,” as we say in the Navy, meaning the lowest levels of the organization. It is not enough to rely on a memo or edict to generate clarity. It needs to be “led” into the company/command with a more personal touch. This takes more energy and a diverse communication style, but will greatly enhance buy-in to your mission, vision and strategy. Your career has consistently found you in high-pressure situations. How do you handle that? I believe it is amazing how the human mind and body can adapt when trained in high-pressure environments. What looks like the seemingly insurmountable task — landing an F/A-18 on the aircraft carrier at night with the deck pitching and no horizon — can be broken down and the focus made clear with the right training. I was honored to be exposed to that environment as it has served me well since. Whether leading through a crisis or navigating tragedy, both of which I have been unfortunate to lead through, those high-pressure experiences have shaped my style and resilience in such situations. What are some of the challenges you faced in your transition to establishing your own business? I was very gratified to have known the date of transition well before it happened, which gave me time to prepare. That preparation came in the form of so many in Central Florida that took the time to mentor me. I was honored to have formed rich relationships with leaders in our region through my participation in Leadership Orlando and other board service activity while still in uniform. I think the most difficult part was packaging and monetizing my value to organizations. Fortunately, I have received some great coaching from former shipmates to mitigate that risk. As I move my business beyond the Department of Defense to a larger market, the challenges are different. As a speaker, executive coach and trainer, I have similar challenges ensuring I have defined the addressable market and effectively packaged offerings for this new customer base. I am learning “in game” ….as always. What are some of the tenets of a healthy organization? As you can imagine, I would start with strong leadership as I believe many of the other tenets flow from good leadership. Leaders need to inspire trust, unleash talent and create clarity, among other things. I believe another important attribute is how you embrace the power of diversity, thought, background, etc. In order to leverage the power of diversity, an organization needs to master conflict. When I use the term “transparency breeds credibility,” it is all about the leader inspiring trust. Younger generations (and others, I would add) buy-in much more readily to leaders who share as openly as possible. The value of emotional intelligence in leadership cannot be overstated. Without an ability to understand personality styles, generational differences and cultural nuances, it is impossible to nurture a high-performing organization. In placing trust in your team, you are inspiring trust while breaking down the potentially toxic pockets of cynicism. CALL FOR APPLICATIONS ATHENAPowerLink is an advisory program which guides women business owners, whose companies are poised for growth, in defining and achieving tangible goals by providing them with access to a panel of business advisors. Working behind the scenes to make you look good! child’s closet because there are too many games or toys stuffed into it. How do we finally get control and make decluttering as easy as taking off a soaking blazer? Let’s attempt to tackle these tasks and bring orderly fashion into our daily routine. Here are some tips I’ve developed over the years: 1. How do you avoid this in your own workspace? Every day before you leave your office, set aside 30 minutes, no matter what, and file away your paperwork, tools and other items that clutter your workspace. I do not have my assistant do it because I know where everything needs to be placed. If you can’t complete this task one day, have a drawer where unfiled paperwork gets placed, and make addressing that file your first task on your next day in the office. Always leave with a clear desk. 2. Get rid of things you don’t need. At work or at home, we have to take on those dreaded drawers or cabinets from time to time. If you just pick two tasks a month to organize, that will be a start. Sometimes a task will need planning and support, like when you want to clean out your stockroom at work or a garage or shed at your home. You might need special tools, shelves, a removal vehicle or a paper shredding company to get it done. Americans of all ages read magazines — especially younger adults. is the publisher and CEO of i4 Business. She can be reached at cherise@i4biz.com. Remember the maze games for children that almost always appeared on the backs of restaurant menus and cereal boxes? The ones we would trace our crayons through, hoping to crack the code the first time around? The trick to those, as most of us soon learned, is to work backward — to start at the finish line and wind a path to the beginning. When you’re trying to direct your audience through the sales funnel to the finish line, you may find yourself facing a problem as daunting as a real-life labyrinth. You know where you want your audience members to end up — your website — but there are so many paths that might take them there and so many false leads that may steer them off course. To make sure traffic goes to the right link, it can be helpful to map out your strategy, treating each step in the buyer journey as a marker that people are on the right course toward the goal. preparing something for print, the publication has a targeted demographic, taking much of the work out of the equation for you. It’s easier to capture audience members’ attention when they are already inclined to learn more. In order to maximize the effectiveness of a print ad and tie it to your digital marketing, make sure to keep your branding consistent. The design, color and verbiage of your print ad should easily be associated with your online efforts. When directing people to your site, try digital calls to action with invitations to check out a certain hashtag, visit your website, or engage with you online through social media. Speaking of social media, this can be one of the quickest ways to get your audience from point A to point B. It might be as simple as a well-written and curiosity-piquing social media post that encourages a reader to visit your website. An engaging post is tailored to the platform and doesn’t give away too much of the story, encouraging your audience to keep reading. But how do you ensure that people find your social media in the first place? Again, this can be done through a print advertisement, but it can also be accomplished through digital means. Cross-channel promotion, boosting posts to certain audiences, relationships with other companies with a strong digital presence, influencer advertising, and constant conversation with your followers are all good examples of the first step on your audience’s journey to your website. Consumers immerse themselves in magazine content both in print and digital editions. is an executive in residence for entrepreneurship and negotiation at the Crummer Graduate School of Business at Rollins College. The school touts top MBA rankings and is among a select group of business schools carrying AACSB International graduate-level accreditation, including the first accredited Executive Doctorate in Business Administration program in the state. I often speak with entrepreneurs about the difficulty in raising capital from individual angel investors — a feat that often proves more difficult than raising capital from angel groups. Entrepreneurs are accustomed to going through the motions of securing a coveted invitation to present to an angel group (and often presenting again), receiving a term sheet from the group, proceeding with negotiations and then closing the deal. When it comes to individual angel investors, it’s a completely different dance. The secret doesn’t lie in how you ask, it lies in how you build up to it — how you build the relationship, garner trust and convert them to serve as your evangelists. and a great place to start, as are blogs and articles on www. kauffman.org that discuss raising capital from angels. The audience for print and digital magazines increased by 3.3 million adults from 2016 to 2017.
is the managing partner of The Catalyst Consulting Group LLC. He can be reached at rrecardo@catalystconsultinggroup.org. What do start-up companies Webvan, Pets.com, WebTV, and IndexMedical all have in common? They were companies that had great concepts and experienced initial success but couldn’t scale. Listed below are seven surefire strategies for scaling any business: Develop and execute a strategic plan. Sustained growth starts with having a formalized strategic plan. That means one that’s not in your head. This plan must be based on the company’s core competencies and focused on the appropriate internal growth engines, such as promotions, and external growth engines, such as joint ventures, alliances and partnerships. Three key data points are essential: 1) a vision that serves as the starting point, 2) execution of an annual strategic plan, and 3) a strategy that details the end game — an exit. The song was the first major hit, if you could call it that, by two brothers, Robert and Richard Sherman. They would go on to have Robert craft the lyrics and Richard compose the music for such musical film classics as Mary Poppins, The Jungle Book and many others. Interestingly, the brothers couldn’t have been more different. Robert was described as having the “slow precision of a brooding poet,” while his brother spontaneously combusted his buoyant melodies. Eventually the clash between the two personalities ended the collaboration. The other equally pointless approach is “destructive conflict.” We have all been there, where everything is personal and emotional. Instead of listening, the goal is to win the point or bully others into reluctant agreement. 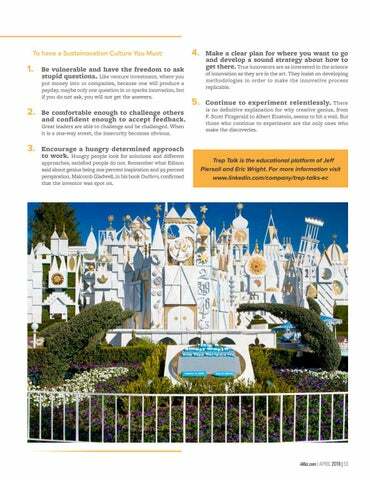 f you visited a Disney park as a child or took your younger children or grandchildren there, you have probably experienced the It’s a Small World attraction. At one time there was a version of the animatronic ride at every Disney park in the world. The famous song, by the same title, is said to have been played over 50 million times, beating out any single from Bruno Mars to the Beatles. three championships (adding to the five Jackson won in Chicago). put money into 10 companies, because one will produce a payday, maybe only one question in 10 sparks innovation, but if you do not ask, you will not get the answers. Be comfortable enough to challenge others and confident enough to accept feedback. Great leaders are able to challenge and be challenged. When it is a one-way street, the insecurity becomes obvious. Encourage a hungry determined approach to work. Hungry people look for solutions and different approaches, satisfied people do not. Remember what Edison said about genius being one percent inspiration and 99 percent perspiration. Malcomb Gladwell, in his book Outliers, confirmed that the inventor was spot on. of innovation as they are in the art. 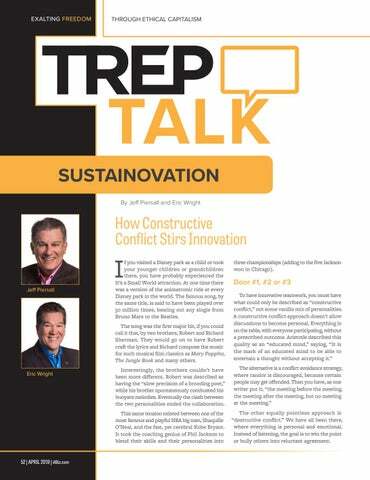 They insist on developing methodologies in order to make the innovative process replicable. is no definitive explanation for why creative genius, from F. Scott Fitzgerald to Albert Einstein, seems to hit a wall. But those who continue to experiment are the only ones who make the discoveries. ary Ann Gonzalez filtered throughout the foster care system all of her life. Uprooted and relocated countless times, Gonzalez felt alone and lost. At age 8, she got involved with the Special Olympics. Immediately, her coaches and teammates supported her, encouraged her and helped her find footing. They quickly became family. The sense of cohesiveness and spirit she found in Special Olympics allowed her to dream big and set goals for her professional and academic life. Years later, while attending college, Gonzalez began to struggle in her courses despite her confidence and sense of purpose. On the edge of her seat in the front row of her classrooms, she strained to grasp the lessons. Gonzalez went in for an evaluation. She learned that her hearing had degenerated over the years. She needed hearing aids. Once she received the devices, her classroom performance and comprehension improved instantly. Forty-seven years after Gonzalez first stepped foot on a field and joined the Special Olympics family, she serves on the leadership council, has a full-time job and is graduating with a computer science degree from Lake-Sumter State College. She attributes her self-confidence and drive to the support she received from her coaches and her teammates — her adopted family. Through Special Olympics, Gonzalez competed in several sports including basketball, golf, softball and volleyball. She went on to become a certified official, officiating for the Special Olympics at the 2003 World Games in Ireland and the 2007 games in China. She was inducted into the Florida Sports Hall of Fame in 2004. 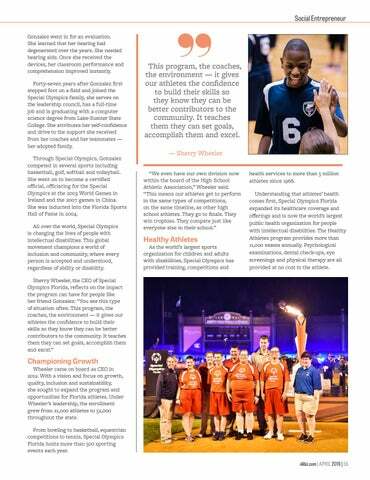 All over the world, Special Olympics is changing the lives of people with intellectual disabilities. This global movement champions a world of inclusion and community, where every person is accepted and understood, regardless of ability or disability. health services to more than 5 million athletes since 1968. 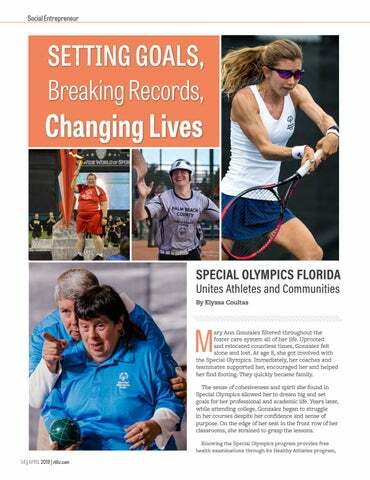 Understanding that athletes’ health comes first, Special Olympics Florida expanded its healthcare coverage and offerings and is now the world’s largest public health organization for people with intellectual disabilities. The Healthy Athletes program provides more than 11,000 exams annually. Psychological examinations, dental check-ups, eye screenings and physical therapy are all provided at no cost to the athlete. Thursday, April 11, 2019 | 5:00pm - Starke Lake, Ocoee Indulge in a variety of beer, wine and spirits from some of your favorite local restaurants along with scrumptious samples, including your favorite French, Italian, American and BBQ dishes! Best Fest is a street party-style event that is open to the public. Bring your friends and enjoy all the best of West Orange! All for one admission price! Sponsorship and Vendor Registration Open Now Showcase the BEST aspects of your restaurant or business to well over 1,000 potential customers at Best Fest! To sponsor this event and for vendor registration, please visit wochamber.com or call 407-656-1304 today! Unique experiences for your day off LAKE WALES Bok Tower Gardens The lush scenery at Bok Tower Gardens provides an everchanging work of art for visitors strolling through the grounds. The wandering landscape, designed to be a contemplative and informal woodland setting, offers romantic strolls and tranquil resting spots, picturesque vistas and breathtaking views of the Singing Tower. Spectators can admire the stunning 205-foot neo-Gothic structure adorned with stained glass and a 60-bell carillon that orchestrates haunting melodies. ORLANDO Orlando Watersports Complex Known as the No. 1 wakeboard park destination in the world, the Orlando Watersports Complex decided to make even more waves by adding Central Floridaâ&#x20AC;&#x2122;s first inflatable aquapark. The aquatic jungle gym features areas to climb, slide, bounce and splash. It floats next to the complexâ&#x20AC;&#x2122;s two-tower wakeboarding cable system and boating lake. Guests can test the waters with wakesurfing, kneeboarding or stand-up paddleboarding, or they can simply enjoy themselves in the sun at the snack bar. 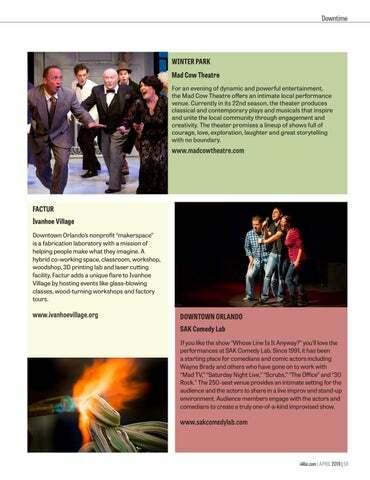 WINTER PARK Mad Cow Theatre For an evening of dynamic and powerful entertainment, the Mad Cow Theatre offers an intimate local performance venue. Currently in its 22nd season, the theater produces classical and contemporary plays and musicals that inspire and unite the local community through engagement and creativity. The theater promises a lineup of shows full of courage, love, exploration, laughter and great storytelling with no boundary. FACTUR Ivanhoe Village Downtown Orlando’s nonprofit “makerspace” is a fabrication laboratory with a mission of helping people make what they imagine. A hybrid co-working space, classroom, workshop, woodshop, 3D printing lab and laser cutting facility, Factur adds a unique flare to Ivanhoe Village by hosting events like glass-blowing classes, wood-turning workshops and factory tours. DOWNTOWN ORLANDO SAK Comedy Lab If you like the show “Whose Line Is It Anyway?” you’ll love the performances at SAK Comedy Lab. Since 1991, it has been a starting place for comedians and comic actors including Wayne Brady and others who have gone on to work with “Mad TV,” “Saturday Night Live,” “Scrubs,” “The Office” and “30 Rock.” The 250-seat venue provides an intimate setting for the audience and the actors to share in a live improv and stand-up environment. Audience members engage with the actors and comedians to create a truly one-of-a-kind improvised show. Chamber President and CEO Stina D’Uva and West Orange Foundation Chairman Joe Alarie with award recipients Chris Garcia, Dennis Foltz, Bill Heichel, Lynn Walker Wright, Geegee Burmeister, Orange County School Board Chairwoman Teresa Jacobs, Debbie Clements and Ken Kupp, along with Chamber Chair Tim Haberkamp. Who’s taller than the Ringmaster! By providing homes for 339 Central Floridians experiencing chronic homelessness, the Housing First strategy reduced their emergency room visits by 60%. Visit HomesAreTheAnswer.org to learn how Housing First saves lives, saves money, and gets people off the streets for good. designation. UCF’s goal is 70 percent by 2020.
and be part of a unique environment that provides C-Level Executives with new and fresh insights into Corporate Leadership at the highest level. Exchange ideas with experts in Corporate Governance, Finance, Tax, Risk Management, Marketing, Long Range Planning and much, much, more. MEET TWO OF OUR TRUSTED CEO ADVISORS John Andersen | CEO, Merchant Consulting Service, Inc. 321-800-6533 | www.merconserv.com “At each Forum I receive so much more than I give.” Take Control of Your Operations. For more than 25 years, Merchant Consulting Service (MCS) has® dedicated itself to helping businesses of all sizes and types take control of their merchant accounts. Through our consultative approach and trademarked DACTA process, MCS will listen to your needs, analyze your accounts and help you understand how credit card processing REALLY works. Once becoming a client, your merchant accounts will be audited on a regular basis to ensure you always pay exactly what you were promised. This eliminates “rate creep”, thereby putting more money to your bottom line and keeping it there. Lee McMillen | Large Risk Consultant 407-869-4200 | www.morseagency.com “My involvement with CEO Leadership Forums has been transformative to my organization.” Protect Your Assets. As a long-established full service independent Orlando insurance agency, we have both the experience and dedication to offer you the highest level of customer service, delivered on time, every time, for any type of insurance need. Events located at Valencia College West Campus 8:00am -12:00pm See website to register and review Forum topics and details. Specializing in personal and commercial insurance for auto / home owners. Commercial property insurance, general liability, workers compensation or any other lines of insurance. The Morse Agency can help you protect your assets. © 2015 Southwest Airlines Co. Without a Heart, it’s just a machine. So in 1971, a little Heart built a different kind of airline—one that made sure everyone could fly. Everyone has important places to go. So we invented low-fares to help them get there. To us, you’re not 1A or 17B. You’re a person with a name, like Steve. Here, we think everyone deserves to feel special, no matter where you sit or how much you fly. And with all the places we’re going next, we’ll always put you first, because our love of People is still our most powerful fuel. Some say we do things differently. We say, why would we do things any other way? Without a Heart, it’s just a machine. Find a lender that cares when shopping for a new home. Let Shelter Mortgage take the stress out of buying a home. 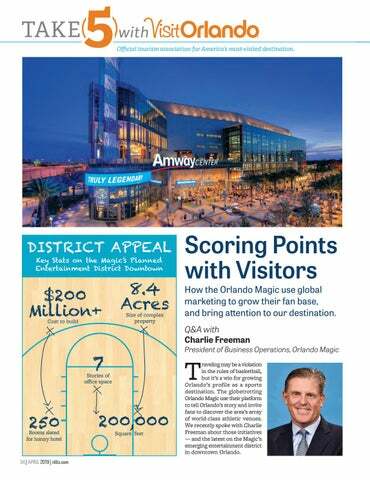 How the Orlando Magic uses global marketing to grow their fan base and bring attention to the Orlando region. 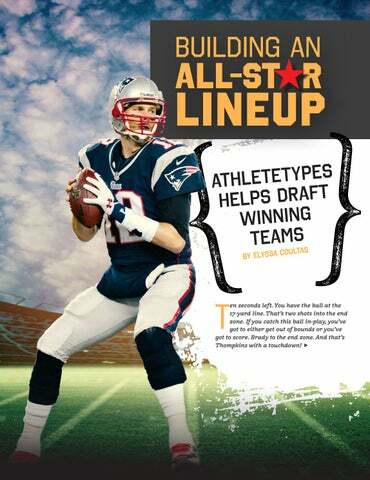 Science and sports unite with AthleteTypes personal profiling assessment and mentorship platform. The Cure Bowl unites sports fans and healthcare to raise awareness and funds to put an end to cancer. 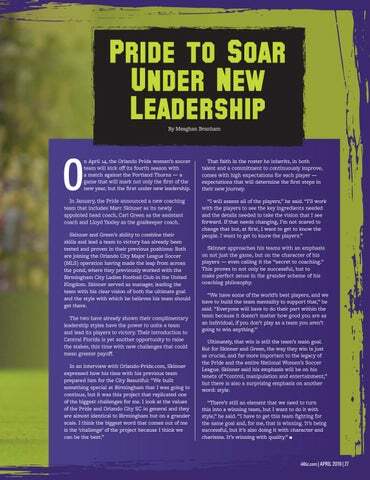 The Orlando Pride is under new management and welcomes the new leadership. 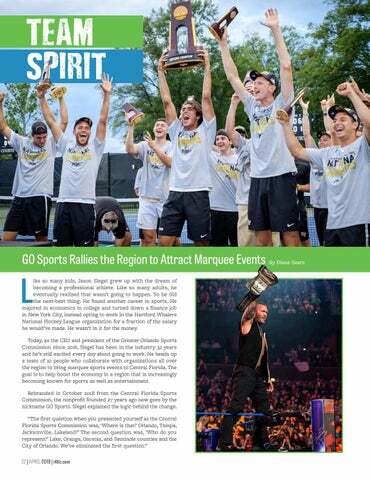 Greater Orlando Sports attracts crowd-drawing events to the Orlando region. 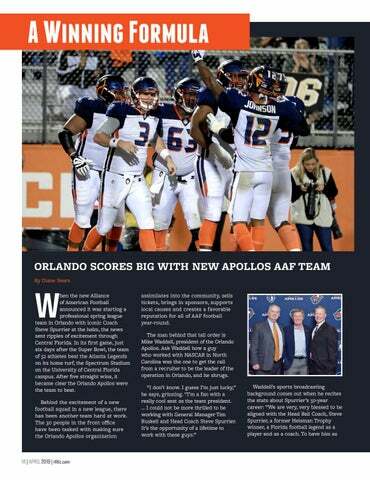 Orlando scores big with new Apollos AAF team.